La Flûte Norvégienne – Tom Ottar Andreassen (flute) / KORK / Ingar Bergby (conductor). Bræin, Kvandal, Hovland. Lawo Classics. Catalogue number: LWC1127 (2017). Halvorsen · Kvandal · Nyhus – Ingfrid Breie Nyhus & Åshild Breie Nyhus. Participating musicians: Bjørkum, Per Sæmund (violin), Skalstad, Per Kristian (violin), Rensvik, Anders (viola), Sandvik, Audun (cello). Simax Classics. Catalogue number: PSC1333 (2016). KVANDAL, J.: Piano Works (Complete) (Knoph). Naxos Grand Piano. Catalogue number: GP739 (2016). Oslo Kammerakademi: The First Beauty. Klein, Kvandal, Yun, Åm. Lawo Classics. Catalogue number: LWC1093 (2015). Ensemble Allegria: Ensemble Allegria. Grieg, Kvandal, Nystedt, Grüner-Hegge. Lawo Classics. Catalogue number: LWC1044 (2013). Per Hannisdal & Vebjørn Anvik: The Lyrical Bassoon. Saint-Saëns, Hindemith, Elgar, Kvandal. 2L. Catalogue number: 2L-097 (2013). Classical Harmonica. Sigmund Groven (harmonica) & Ivar Anton Waagaard (piano). Includes Stemning (Mood) op. 74 by Johan Kvandal. Grappa. Catalogue number: GRCD4393 (2012). Black Bird – Sort Fugl. Fredrik Fors (clarinet) and Sveinung Bjelland (piano). Stravinsky, Saint-Saëns, Schumann, Grieg, Kvandal. 2L. Catalogue number: 2L-055-SACD (2010). Monrad Johansen. Kvandal: Piano Concertos. Pan. Håvard Gimse (piano), Christian Eggen (conductor), Ole Kristian Ruud (conductor), Oslo Philharmonic Orchestra. Simax Classics. Catalogue number: PSC 1234 (2008). Great Norwegian Performers 1945-2000. Vol. 1. Includes Concerto for flute and orchestra op. 22 by Johan Kvandal. Simax. Catalogue number: PSC1830 (2006). Elk Sonata. Håvard Gimse (piano) & Lars Anders Tomter (viola). Nordic Sound. Catalogue number: NOSCD1967 (2006). Frøydis Ree Wekre: Ceros. Includes Hymn Tune, op. 68 no. 1 by Johan Kvandal. 2L. Catalogue number: 2L-025 (2005). Stig Wernø Holter: Din Rikssak. Norsk orgelmusikk gjennom 100 år. Includes Fantasia for Organ op. 83 by Johan Kvandal. Vest-Norsk Plateselskap. VNPCD200567 (2004). Morten Carlsen: Melankoli. Works for solo viola. Includes Elegi op. 47 by Johan Kvandal. 2L. Catalogue number: 2L-001 (2001). Johan Kvandal: Concerto for violin and orchestra op. 52. Includes Antagonia op. 38 and Concerto for oboe and orchestra op. 46. Aurora. Catalogue number: NCD-B 4955 (2000). Norwegian 20th Century String Quartets (Valen/ Egge/ Kvandal/ Janson) – Oslo String Quartet. Naxos. Catalogue number: 8554384 (2000). 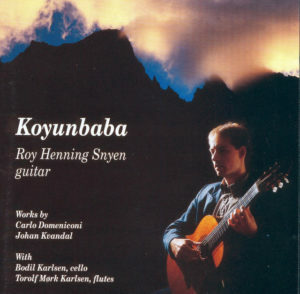 Koyunbaba – Roy Henning Snyen (guitar). Includes Sonata for solo guitar op. 65, Duo for flute and guitar op. 78 and Quintet for Hardanger Fiddle and String Quartet op. 50. Bergen Digital Studio. Catalogue number: VEPSCD3295 (2005). Posted in Recordings and tagged as albums, buy, CD, recordings.